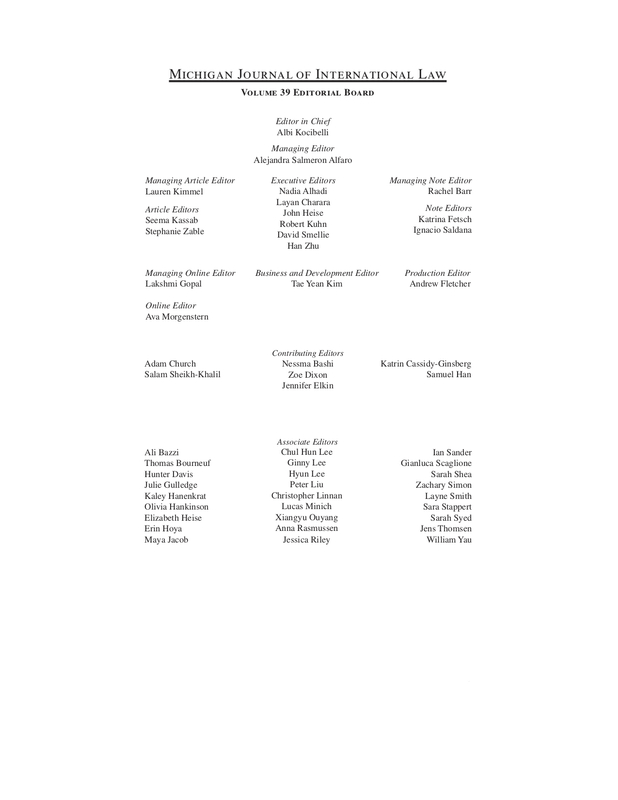 Over the years, the journal has worked to cultivate leadership and expertise among its associate editors. New boards are elected each academic year through an open election process. Candidacy is open to the journal’s Associate Editors. To take part in MJIL’s competitive election process, each associate editor submits a statement of interest, a summary of prior experience with International Law, and a resume. Each candidate participates in a rigorous two-day interview process. After the first day of interviews, current board members select leadership-at-large of the journal: the Editor-in-Chief and a Managing Editor. For the second day of interviews, the newly appointed editors join the current board to deliberate and vote on all remaining vacancies. Through this process, the journal works to support the professional and scholastic development of all journal members by providing accessible and competitive opportunities to develop leadership and academic skills through contribution to the vital work of the journal. The linked list below presents a compilation of all members of the journal from volumes past. Please contact the journal (using the address information in the footer) with any questions or comments.